After having a good race on Tuesday I was hoping I would be able to get a good result on Saturday. The race was just a local 3/4 race at Hillingdon run by the Westerley. I finished 2nd place from a breakaway a few years ago so I was quite confident I would do well. This all changed when I realised how many good riders were there, the sort of riders who should really be riding Elite races. Clive Nicholls from High Wycombe was there and he’s a super strong rider who has been out for a while. I signed on as number 72 and I was told that there were 86 riders in our race, this is a clear indication that there are not enough 3rd cat races to cater for the increase in popularity. 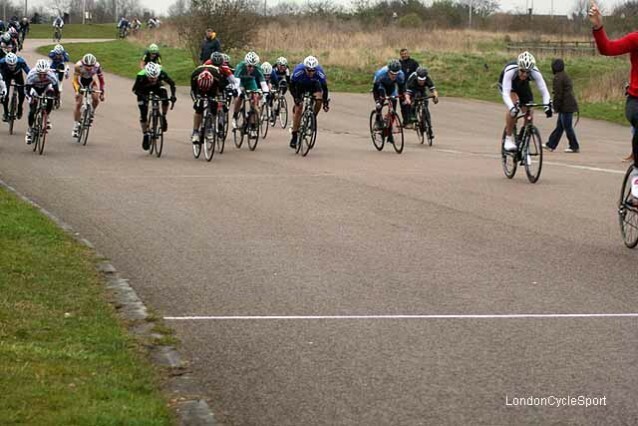 It’s a bit of a shame that there isn’t a weekend summer series at Hillingdon to match the winter series. The race was quite fast for a 3/4 race, we were averaging well over 25mph for the first half, normally you would expect these races to be under 25mph easily. I started to realise this might not be as easy as I had hoped. I spoke to Clive and we discussed getting in a break together, we’d agreed to leave it to allow the bunch to wear themselves down. With around 10 mins remaining I saw Clive move to the front. I followed him and although Clive didn’t realise this there were 4 of us away and we had a small gap. Clive hit the front as hard as he could and shot off. Unfortunately I was behind the other riders in the group and I didn’t get on his wheel. As you can see I wasn’t anywhere near strong enough to get across to Clive. Clive was eventually caught and the bunch sprint was inevitable. 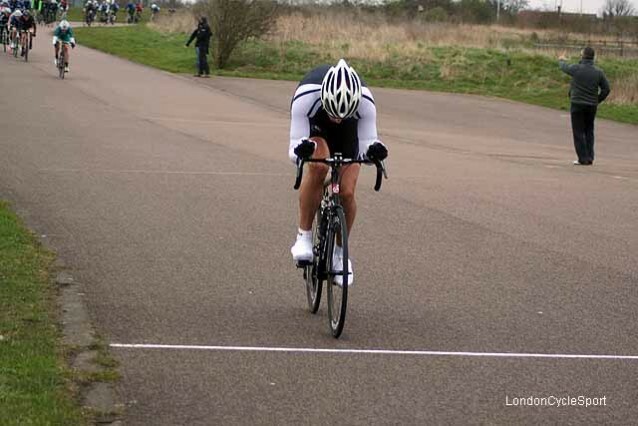 Clive went off early and held on for 2nd place, the sprint was won by Jo Skelton of Look Mum not Hands. Jo’s a excellent sprinter and can normally out sprint the Elites. As for me, I was in about 5th place coming around the final corner but the rider in front of me just stalled and I lost about 6 places on the right side of me as you can see below. I finished 12th and a little bit disappointed.